Many dogs tremble or shake, even when it’s not cold outside. This is especially common in small dogs like Chihuahuas. While shivering can be just a normal fact of life for some dogs, it can also be a warning sign that something is amiss. There are many different reasons that your dog could be shaking, ranging from benign to concerning. Whether or not you should seek treatment will depend on the opinion of your vet, but keep in mind that some of the reasons dogs shiver are quite difficult to pin down. There are many different reasons that dogs shake. Let’s explore some of them now, starting with the least serious explanation and moving up from there. Many dogs with thin coats or low fat content, like Greyhounds and Dobermans, get cold easily. Even if it’s 50 or 60 degrees F outside, some dogs get chilly. Be especially cautious if it’s humid or rainy, as this makes dogs feel colder. If your dog’s shaking doesn’t stop once you’ve warmed her up, check with your vet to ensure there’s not something else going on. Some small dogs “just tremble.” Anyone who’s been around a few Chihuahuas or Miniature Pinschers will agree that many of these little dogs just tremble a lot. Experts haven’t been able to nail down exactly why, but it could be that small dogs are cold more often, they’re more anxious, or another unknown reason. Be more concerned if the trembling is a new behavior or if it accompanies other changes in your dog’s behavior. If your small dog trembles a lot, ask your vet about it. Your vet can assess muscle tone and check for other reasons your dog might be trembling. She may diagnose your dog with Generalized Tremor Syndrome (GTS), which can be treated with corticosteroids. Have you ever exercised so much that your muscles quiver a bit? Or noticed that a pulled muscle vibrates when you move the wrong way? The same can happen to your dogs! Quivering is common symptom of pain, injury, or weakness. Check with your vet if shaking is limited to a given area (say, the right hind leg), started after some heavy exercise, or is accompanied with a decrease in activity level. You may notice that the muscle tremor gets worse if you touch the area, attempt to stretch or massage it, or exercise your dog. Many dogs that tremble due to pain or weakness will also appear stressed. Strong emotions can make dogs tremble or shake. If you notice that your dog’s trembling starts and stops in specific situations (like at the vet, when guests are visiting, or on walks), there’s a good chance that there’s an emotional reason for your dog’s shaking. Even if this is caused by excitement instead of fear, it’s a good idea to get help teaching your dog to feel relaxed. In this case, it’s often best to see a Certified Dog Behavior Consultant to learn how to help your dog feel more relaxed in a given situation. Skip the local obedience trainer, since they’re more skilled at teaching commands than changing emotions. Your dog behavior consultant may suggest that you speak to your vet about behavioral medications for your dog if it seems like the behavior modification protocols aren’t helping much. There are a lot of scary diseases out there that can cause your dog to shake. Distemper, neurological diseases, kidney disease, and seizure disorders (as well as many, many more diseases) can all cause shaking in dogs. Keep careful track of any other changes in your dog’s behavior, activity level, and appetite. 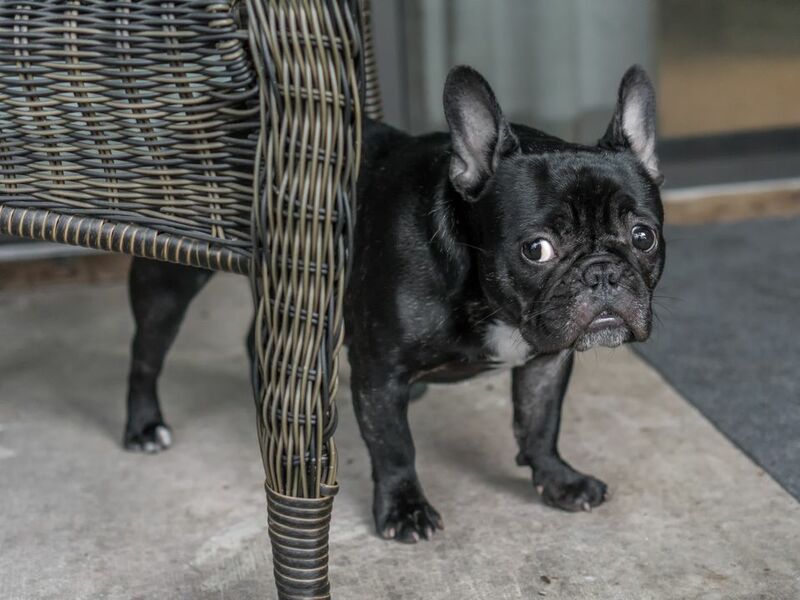 Pay close attention to the frequency, odor, and consistency of your dog’s stool and urine. If your dog’s shaking is relatively new and accompanied with other symptoms, get a full veterinary workup as soon as possible. There may be bloodwork and other tests involved, but it’s worth it for your pup’s health! While some of the diseases that cause shaking are treatable or manageable, others, like distemper, are very serious and often fatal. Vaccinate your dog to help prevent distemper. Good preventative care can also stave off kidney disease. The causes of seizure disorders and neurological disease can be harder to pin down. Eating many different toxins can cause your dog to shake or have seizure activity. Take your dog to the vet and call Animal Poison Control (888-426-4435) right away if your dog has started trembling after eating something. Toxins can cause a medical emergency very quickly, so don’t “wait and see” if you think your dog’s shaking was caused by eating something new. Treatment for a shaking dog will vary based on the underlying cause. For a dog that's cold or excited, treatment may be as simple as warming her up or calming her down. If that's not helping, it's probably time to see a vet. Your dog’s shaking is accompanied with other symptoms, like lethargy, anxiety, diarrhea, limping, or vomiting. Your dog’s trembling is interfering with normal behavior like playtime or sleeping. Your dog starts shivering after ingesting something unusual. Your dog appears distressed when he’s shaking. Pay special attention to “calming signals” such as stress panting, lip licking, or ears that are pulled far back. If your dog is sick or injured, the treatments will likely require veterinary help. Your vet may prescribe rest, massage, or even surgery—all dependent on the underlying cause of your dog's shaking. Depending on what your dog ate, a dog that's shaking due to toxins might just need to vomit. Be sure to speak to a poison control center to double-check. Again, the specific prevention will depend on the cause of your dog's shivering. Keeping your dog warm, relaxed, up-to-date on preventative care, well-exercised, and away from toxic "snacks" can all help keep her from shaking. That said, certain breeds or individuals might be more prone to the mysterious "Generalized Tremor Syndrome," which has no known way to treat or prevent. It’s important to get help if your dog’s shaking is accompanied with behavior changes, other symptoms, or started after eating something new. While shivering can just be a simple case of Generalized Tremor Syndrome or cold, it can also be a symptom of serious diseases or even anxiety.